I hope everyone had a wonderful Labor Day Weekend! I sewed the entire weekend since it was both an extended weekend and our first weekend for National Sewing Month! I had lots of projects on my to-do list and had piles of fabric on my cutting table to get me started. The first thing I worked on was a Birthday present for my sister-in-law, which I will gift next weekend; stay tuned for the reveal. 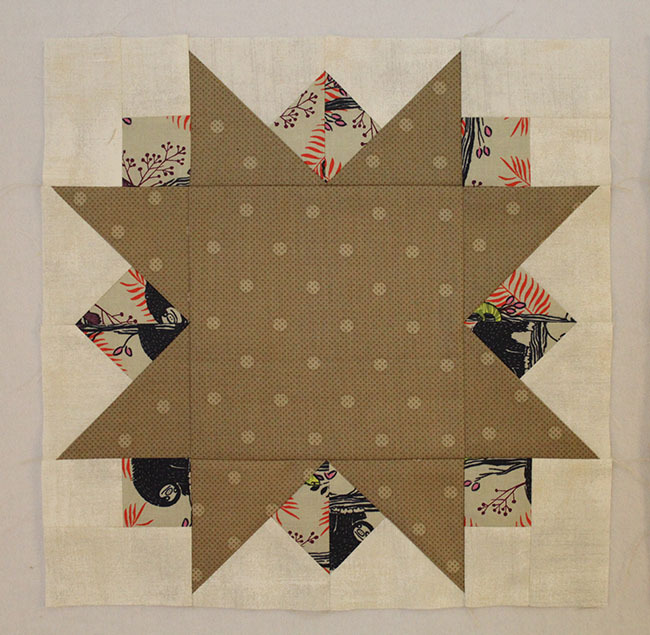 I also caught up on my TBT blocks, which I was behind on by two tutorials. I will reveal these blocks on Thursday! The third project on my list was my wall hanging quilt and I completed 2 more Sunburst Blocks. Finally, I got started on the next baby quilt for a cousin on my husband’s side who’s having a boy! She’s not due until November, but the shower is at the end of this month and I was able to get all the pieces on my design board. All I need to do is sew the rows together and I can get started on the quilting. 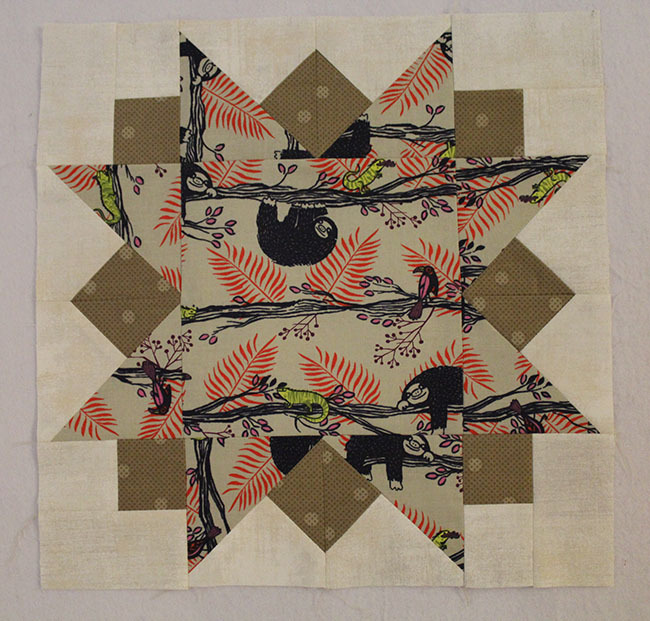 I designed a simple Four-Patch and plan on straight-line quilting, so I should be able to complete this quilt on time. What did you complete this Labor Day Weekend? My hanging wall quilt is from the Moda Bake Shop and it’s called the Sunburst Quilt by Lauren Terry. I’m making a smaller version using 9 blocks, instead of 12, and will finish 36″ x 36″. 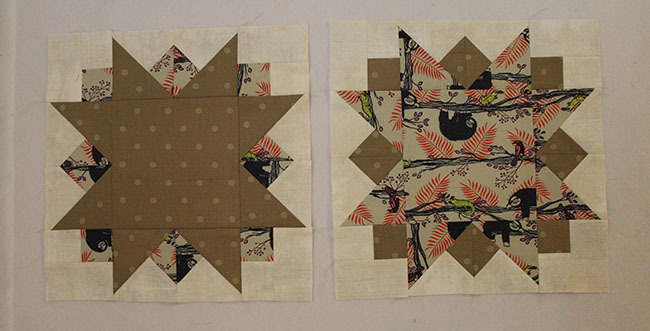 The fabric cuts per fat quarter makes 2 blocks, so it will be difficult deciding which block to omit from the front. 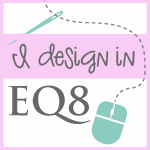 It won’t be wasted and will probably be used as a large quilt label for the back. There are many seams in creating these blocks and the Strip Stick has come in handy. It allows me to press open seams without disrupting surrounding seams. Both open and side pressed seams are required to nestle seams and to minimize bulk, which took up to my fourth block to find a happy mix. The background fabric that I’m using with all blocks is Moda’s Grunge Basics in Winter Mint. Every time I go to the fabric store in search of a solid, I’m always intrigued by Moda Grunge. I love the white and cream together! 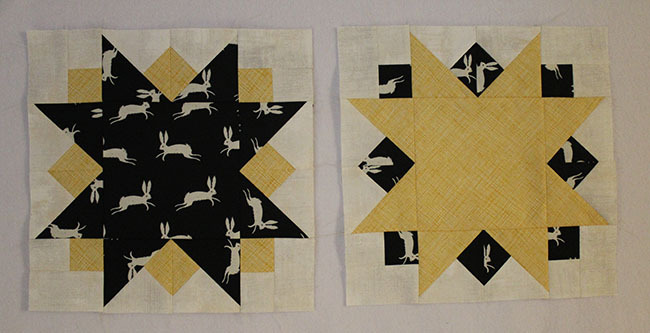 Block 1 and 2 feature Ghost Bunny by Sarah Watts for Cotton and Steel and Carolyn Friedlanders Crosshatch in Curry for Robert Kaufman Fabrics. Block 3 and 4 features Lazy Day in Neautral/Red by Sarah Watts from her Honeymoon Collection. I’m not sure which line the brown polka dot fabric is from, but it paired perfectly with Lazy Day. Fantastic! You were a busy sewing machine. That lazy day honeymoon fabric gives me a smile. That was kind of my labor day weekend. I sewed my step grand-daughter a dress and practiced some FMQ on my handi quilter sweet sixteen. Thank you! Those seams are tricky. My little machine wasn’t happy with the bulk. I love how different they look just reversing the colors. I love the negative positive effect. 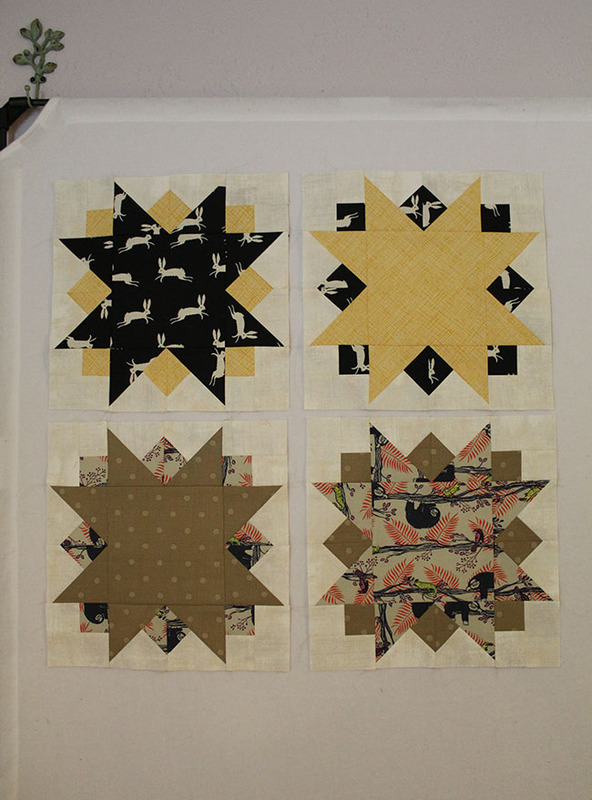 Gorgeous blocks! Thank you! Can’t wait to sew the next pair. It will be tough picking one for the back.